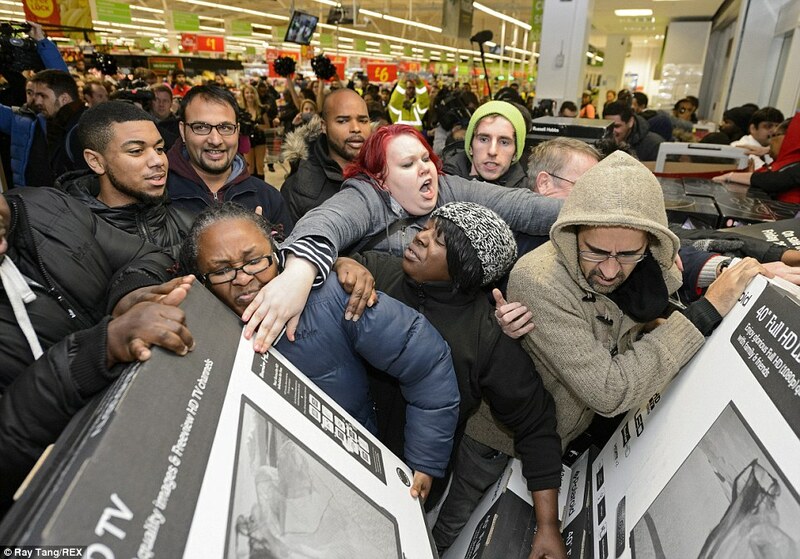 Black Friday Sent A Powerful Message To Our Politicians: Listen To The 1%. The holiday season is about all how we spend the time we have and the money we make. What do we choose to do with precious resources we're given? This post isn't about the lines, camping or number of people who shopped. It's about much more than that. The number of people who shopped. It's not that bad. There's an article making the rounds online claiming more than twice the number of people who voted in 2014 shopped last Friday. With lines out the door, even people camping out for days or weeks, it can be a pretty sad comparison for American's enthusiasm for their democracy. Which we're constantly lamenting. This article is wrong. In the final tally, only 102 million people went shopping, dealing with the insane lines and crowds. Just 34% more than voted in 2014, not 100%. So, no problem right? Let's say you wanted a nice, intimate dinner with the President and a chance to network with some of New York's finest one-percenters. This is the perfect opportunity to get in good with Obama, or whoever's President (as the cost is determined by giving limits), and make it known that your support doesn't come free. For the ultra-rich, it costs a meagre $36,000 to get your issue directly in front of the President - and you get a ridiculous, private dinner from a 5-star chef to-boot! On the other hand, this Thanksgiving people gave over $71,145 away to Cards Against Humanity for absolutely nothing except a joke. Not even a copy of the game. At $5 a pop, people literally handed over TWICE what it costs to get a seat with the President of the United States to a for-profit company. What did they do with all that money? Well, they bought themselves toys. $6.9 billion: Total estimated Halloween consumer spending in the United States for 2015. 64: Percent of Americans who planned to celebrate Halloween this year. In 2012, small donors gave $284 million to both Presidential candidates combined with a voter turnout rate of 55%. Think about that. 9% MORE people do Halloween than vote and they're spending 2,253% more on it. For perspective, that is over 3.5 times the cost of ALL Presidential campaign spending COMBINED - no SuperPACs or Billionaires required. When you think about it, it's obvious. Combined, American easily have the firepower - in votes and money - to put their issues in front of Presidents and fund entire elections themselves. In fact, if all the small donors gave, it would probably reduce the cost of elections because politicians would know their actually reaching people. But it's not like it costs a lot as it is. A dinner with the President is easily within the reach of the mega-rich; in part because everyone else isn't giving. The 1% don't run politics simply because they have more money, it's because they invest money in ways that yield a return. Including in politics. Alternatively, it seems people would literally rather give their money away to a funny (but still private) corporation to pad the owners' pockets. But maybe the problem is just that we don't have a way of putting our money together to demand things of politicians like wealthy donors. Maybe if people could see their power, up front and personally, it would change things. Well, that's what we're working on at ShiftSpark. Please come by and check out what we're doing, we'd love to hear your thoughts. Beyond PACs: What's a 501(c)4?! Happy Thanksgiving! This is the time of year when we all sit around the table trying to avoid politics. But should it come up, isn't it nice to know a little something? Campaign finance is an alphabet soup of FEC, local Board Elections and IRS labels. Beyond your PACs, which file with campaign finance regulators, there's a whole host of non-profit entities to content with. The most common is the 501c4; a non-profit which engages in specific political advocacy. Are only partially tax exempt - donors don't get a deduction for giving (like with a c3) but they don't pay income tax. There is a LOT going on with the specifics of how these entities at operate and, here at ShiftSpark, we're most thankful this year for everyone working to educate the public on how their system works (no matter how complicated it may be)! Thank you to Bolder Advocacy for creating this truly amazing and comprehensive guide to 501c4s! Also, check out their really nifty (super-short) explanations of ALL the types of non-profits; complete with a handy chart, here. Our First Funded BernSpark Campaign! Along with ShiftSpark, we also built BernSpark at the request of Bernie grassroots community. On BernSpark, activists can raise money for their creative projects while we give them tips on Federal regulation. Congratulations to Roger in Westchester NY! His campaign to plaster his community with 10,000 high quality pieces of Bernie let was a total success. Within a two week timeline Roger was able to surpass his goal and raise over $500 from the BernSpark community to make a difference where he lives. My name is Roger from Westchester4Bernie.org. On the recent campaign conference call, in the NY State breakout, I was called on by Robert Reeves to speak because I have organized a large number of events in just 5 weeks. I have a county voter database from the state, which has yielded walk lists, and my IT guy wrote an app that harvests phone numbers. We have all the tools we need to contact all 256k Democrats before paid campaign staff arrives in NY. Our volunteers have been printing out our own lit, it gets expensive. I've spent $160 on ink in 5 weeks. I found a union printshop, ALiGraphics in West Harrison NY that will print 10,000 pieces of 4x6 color glossy Bernie lit for $467.08. Non union shops will do the job for $300. Our volunteers have gained a lot of experience over the last month, and deserve professionally designed & printed lit. Our lit is similar to Bronx $ Bernie lit, I have included a photo of the Bronx lit ours will be modeled after. Congratulations again to Roger, and thank you to him, and all the amazing organizers, doing the grassroots work engaging in democracy! Want to start a project? Spark you own project, America can't wait! Politics is everywhere - from the White House, to your office, to college game day. This has been made abundantly clear by the resignation of the University of Missouri's President (and soon Chancellor) after protests by the college football team over the handling of race issues on campus. This major success of student activism, however, has been touted widely as the triumph of people power. As we've been writing about on this blog in relation to American politics, though, that's not quite the case. Like success in other forms of politics, it is a success of economic pressure as well as people. This is particularly clear when you realize a much less publicized hunger strike preceded the football strike. Ignoring the resource argument is not only misleading, it's damaging to future movements. If we want people power to work anywhere, we need to be honest about the true mechanisms for change here. "...[T]he team's protest threatened immediate economic damage to the university. This is perhaps the biggest issue at play. A contract between Missouri and BYU obtained by the Kansas City Star reveals that cancellation on the part of the Tigers would result in a $1 million fine to be paid to BYU within 30 days of the cancellation." Beyond this, the value of College Football cannot be overstated. Afterall, Gary Pinkel, Mizzou's coach, is the highest paid public employee in the State making a whopping $4.02 Million per year. This far exceeds even Missouri's Governor who makes a relatively paltry $133 Thousand annually. "Missouri's athletic program generated $83.7 million in revenue last year, on $80.2 million in cost — a net of $3.5 million in profit. That's a lot of money — but it's actually fairly low for a public university." If you look at Missouri's revenue and expenses, you realize that the $3.5M from sports is actually 3.5% of their overall profit. That's a LOT. And this is before you factor in the future potential earnings of winning a college bowl which can result in payoffs ranging from a LOW of $325K to a high of $22M. And don't forget sponsorships and deals. Missouri, for example, also gets another $2.2M from Nike, plus a bonus if they make a bowl. This isn't to say people don't matter. Of course they do. But, as in American politics, putting resources at risk is a necessary and powerful component in any activist toolbox. That's why we created ShiftSpark, so that alumni, donors, anyone, can turn their resources into power with just a click. If you're a politician, your main concern is probably getting elected. Yes, there's lots of important issues, but even if you're the most principled of the principled, you probably realize you can't do much if you're not in office. So, how do you make sure you get those all essential votes? A new trend is exposing not just what politicians will do, but the underlying mechanics of democracy and sheds light on why money is so powerful. Last week the New York Times reported on Neuropolitics, which uses sensors to track facial expressions, eye movement and other biometrics when people look at political ads. The goal? To determine what people like, and change the message so they like it more. The tools of our democracy make it exceedingly hard for voters to tell politicians what they actually care about. That's the story, not that politicians are experimenting with new technologies or even that they are desperate to figure out what voters like. A democracy is meant to be driven by the will of the people but politicians find it so hard to figure out what that is, they are willing to settle for an ad that makes you smile for a split second in the hopes that reveals something about what you want them to do. It's not like this for everyone.There is one group whose desires politicians understand and reliably transform into law - the wealthy. As a much touted 2014 paper from Princeton University showed, the relationship between what voters want and the laws Congress passes is virtually non-existent. Any law passes with a probability of 30%, no matter what we want. On the other hand, the odds of law passing or failing is well correlated with the sentiments of the economic elite and organized special interests. Politicians have no idea what voters ACTUALLY want. 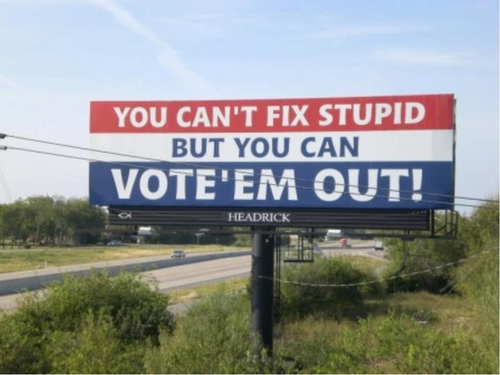 As a result, politicians must convince everyone to vote for them. That means having the best campaign. And that means tools like facial recognition technology on all your ads, which isn't cheap! Voting lets us down because, in reality, voting for candidates - the core of our democracy - is a really, really blunt tool. It is almost impossible to learn anything about the issues someone cares about from their vote. Campaign are run on dozens of issues for hundreds, thousands or millions of people. Figuring out why one person actually voted for a specific candidate is almost impossible. A) spend 5 minutes with 100 voters. B) spend 5 mintues with 2 wealthy donors. You chose A - Good for you! Along come 100 voters - perfect! But you only have 5 minutes - Nooo! What do you do? Talking: Well, there's clearly not enough time to talk to everyone. Well, time's up. Can you tell what you have to do as a representative to maximize your votes? In 3 minutes these two donors have made the case for why their industry needs a tax break. There's no doubt about what they want. There's also no doubt about what they give candidates they like - enough money to hire 10 people to talk to the 100 voters in Scenario A, and buy ads to address every issue they care about. If you want to maximize your chance of winning, you need to be efficient in your fundraising. Because in real life you actually can raise thousands of dollars in a single meeting, but you could never meaningfully talk to 100 voters that way. This is why politicians spend hours on "call time" every day and 45 minutes at a rally twice a week. Voters need a tool that tells politicians what they really want. The problem with the petitions and social media in the scenario above isn't that there's so many people, it's that every action was so easy nobody had to prioritize - nobody had to commit their decision to an issue, which made it impossible to know what to do. The power of the wealthy donors was NOT that they had infinite money, but that they were willing to commit what they had to an outcome they prioritized. Once the commitment was clear, the decision on that specific issue meant verifiable electoral impact. This is what ShiftSpark does. By pairing small contributions with policies, it allows donors to put make a statement about what they will do to change an election because of the issue(s) they care about. And that send a message a hundred times more meaningful than a small smile. Wednesday we wrote about the glimpse Charles Koch gave everyone into the way wealthy donors actually use money to influence policy. Today we continue finding nuggets of truth in Koch's interview. I don't care what party, I just want somebody who's going to advance these ideas to take us away from this two-tier system, getting involved in all sorts of unproductive things, and all this waste and like our, our total unfunded debt and unfunded liabilities. He doesn't "care what party". That statement may seem incredible for someone so closely associated with the Republicans and, in fact, you may not believe him. But you should. This quote reveals something very important about how wealthy interests engage in politics. When you have enough money to get the attention of politicians, you don't care which party wins, you care who listens better. Koch isn't the only example of this. You may have heard that ALL politicians are in the pockets of billionaires, oil, banks, big Pharma and so on. Another way of looking at this is the well known fact that billionaires, oil and banks all give to both the Democrats and Republicans. Why do they do this? Why not pick one party over the other and develop deep bond of trust and loyalty? Because the two party system is BIG and there are people on both sides who are ready to listen (and act) to make sure they have the resources needed to win elections. Ultimately, which party is in office is less important than whether or not you can reach agreement with whoever's elected. (This is intimately tied to Primaries and Party structure which we'll happily break down and expose in another post). So, Money = Attention. At the end of the day, campaigns cost money and whoever has the best campaign wins. That doesn't mean whoever has the most money wins, but traveling to meet voters, paying people to knock on doors, buying flyers and hiring staff isn't cheap. So, if one person (or group of people) can give you a lot, making them happy makes your life a lot easier. And this means that, if you have a lot of money to give, politicians will listen to you and make promises - just for you! As a big donor, you no longer have to worry about parties, you can worry about policies. The real two party system isn't Democrats and Republicans, it's who has access and who doesn't. While voters are all stuck in a Red-Blue dichotomy, privileged individuals and sectors are dealing with their legislative priorities, supporting candidates based on a shared understanding of what the law should be. Once you realize how politics works for the elite, you begin to see that NOT ignoring the party system would be ridiculous. And that being trapped in it is an illusion. How can we break the two-party illusion? Once you see inside the system and understand the incentives, you can hack it, and that's how we came up with ShiftSpark. Instead of dumbing politics down into the old game of two-parties or making unrealistic promises about the power of petitions and "likes", ShiftSpark elevates small donors so they can do the same things big ones do. ShiftSpark puts small donors' money behind policy and only gives it to politicians who listen. That's how we believe we can change the game for the hundreds of thousands who invest their hard earned money in a better country. Attention was intended to be for voters. The Founders didn't anticipate political parties. George Washington actually warned against the nascent parties, which were beginning to form during his Presidency, in his Farewell Address (conveniently broken down on wikipedia). But they also didn't anticipate campaigning - in fact direct campaigning by candidates was rather frowned upon as power hungry. But parties and campaigns came into being because they work. Well, we believe ShiftSpark is a way to put attention back on voters that works. We hope you agree. 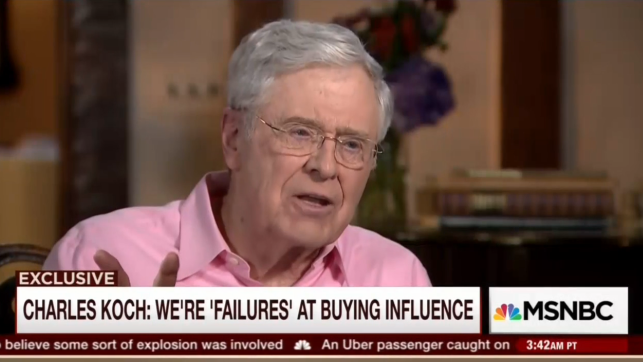 As reported in The Guardian, Charles Koch told MSNBC "that in donating money to campaigns, he expects something in return – for the government to end the corporate welfare system." And in this, he and his brother have failed. Don't feel bad for the them just yet, Koch specifically states he and his brother have failed at dismantling corporate welfare. The reason, as he states in the interview, is completely obvious - even if you're a billionaire, there are other billions backing corporate welfare from industries and individuals that benefit enormously. And here Charles Koch gives us a glimpse at a part of politics often hidden from regular citizens. One of the biggest reasons that wealthy interests get what they want is because they are able to prioritize their demands, make those demands clear and then follow through with something valuable to winning elections. In this case, each business group has its A-list priority; be it lower corporate taxes, subsidies or weak regulations. Through access, by rubbing shoulders with politicians and sending lobbyists, they are able to make the importance of these issues clear to politicians. And then, myost importantly, when elections roll around (or before, because they can donate whenever), they are able to stick to their guns and put their resources where their mouth is. For sure, this is the theory of organizing voters. But sadly, politicians know very well that, with hundreds of important issues and low rates of voter turnout, they cannot depend on the support of organizations which "promise" votes. But what if small dollar donors put their money behind specific policies in the same way as all these corporations and wealthy interests do? That would mean untold billions backing the policies, issue by issue, which benefit them. 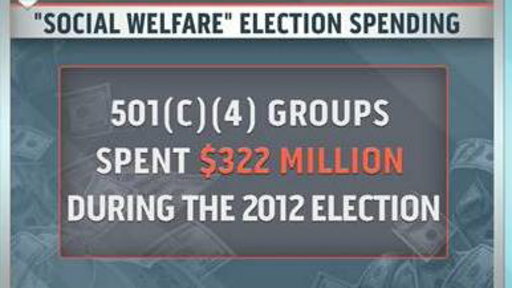 After all, if everyone who turned out to the polls in 2012 (even with the super low turnout) had given $15, it would have easily funded all the spending of both Presidential candidates clocking in at $2 billion. We built ShiftSpark, to do just that. While as individuals we may feel powerless next to the PACs and SuperPACs of the mega-rich, we can't forget that together, without waiting for new laws or constitutional amendments, we can make it impossible for the wealthy to buy legislation. All it takes is using the contributions we're already giving to say something. Sometimes it's easy to forget that even billionaires are limited. But with ShiftSpark, any money that doesn't actually get the result donors want gets refunded. While billionaires are constantly throwing hundreds of millions at elections, everyone making small contributions can sit back and watch them bleed themselves dry - taking money back and reapplying it elsewhere. Perhaps the Kochs have failed to end corporate welfare, but they've still been on a winning streak in other areas. If we're going to beat them, we need tools that are going to change not just elections, but policy. At ShiftSpark, that's exactly what we're making.